If you haven’t yet seen History Channel’s “Swamp People,” you are missing out on all of the tree shaking, gator catching, Louisiana goodness that is the Cajun way of life. When the show first aired in 2010, it gained the attention of millions of viewers, and has still averaged an audience of 4.5 million viewers throughout it's six year run. Viewers range from 18 to 49 years old, and while openly appealing to all audiences, men in particular seem to identify with the down home grit of the fan proclaimed “Swamp King” Troy Landry’s way of life. Whether it’s the spirit of competition, or an innate urge to satisfy the primal man verses beast instinct, viewers are hooked, and Soboba Casino is reeling them in with the opportunity to meet the man behind the hook, live and in person. 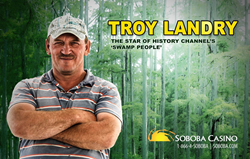 On March 26th Troy Landry will be meeting guests and signing autographs at Soboba Casino, where he is scheduled to give away a grand prize to one lucky patron as a conclusion to the casino’s Get Da’ Gator Drawing. In true off road, backwoods style, the grand prize winner will receive a brand new 2016 Jeep Grand Cherokee. Troy’s free meet and greet with fans is scheduled to begin at 6 PM on March 26th. Entrance to the meet and greet is free, however you must be a Club Soboba member to participate. If you are not a Club Soboba Member, sign up is quick, easy and free at the Soboba Players Club. The grand prize winner will be drawn at 10:00 PM. Soboba Casino will be running their Get Da’ Gator Drawing, which gives guests the chance to win their share of $130,000 in prizes during the remaining promotion days: March 12, 13, 19, 20, 23, 24, 25 and 26 from 4:00 PM until 9:00 PM. Soboba Casino features approximately 2,000 of the newest, hottest slot machines, an expansive and modern non-smoking room, 20 classic gaming tables featuring all your favorite card games, and a large outdoor event arena which easily accommodates over 10,000 people. Need to recharge & refresh? Visit the cozy Soboba Cafe and Coffee Kiicha, or experience AC's Lounge with full cocktail bar and three giant HD flat screens including the “Sobobatron,” the Inland Empire’s biggest HD video wall.